Making the transition from film-based to digital imaging eliminated lugging films across town from the imaging facility to the referring physician—and frequently replaced it with lugging a CD across town. The CDs represent an improvement, but radiologists and others in the imaging community complain about the difficulties these CDs can create. The concept of transporting medical images between healthcare facilities using the Internet is a rising tide. The process certainly requires some safeguards for medical images and healthcare information, but anyone who has shared pictures using Facebook can sense the power of sharing images via the cloud. I recently read a post on the AuntMinnie.com forum page where a user with the screen name P@@x listed the pros and cons (in his or her view) of sharing images across the clouds compared with transporting CDs. That list—and it’s a pretty good one—is paraphrased below and shown in bold type. • Offers easy image access from any computer connected to the Internet: The so-called neutral third party of a cloud archive permits information to be readily shared between computer systems that may not communicate directly. That could prove to be an intermediary step as interoperability evolves, but cloud archiving is a move in the proper direction. Facilities frequently don’t like granting outsider access to their PACS, and a third-party cloud archive addresses that problem. Of course the ability to access images and information from any computer connected to the Internet implies privacy and security threats. Those issues can be addressed but are genuine concerns. • Eliminates lost CDs: Cloud systems should greatly reduce that problem. • Avoids CD shipping costs: That is true, but as noted below, it replaces that cost with the cost of the cloud archiving system. • Enables uploading and downloading medical images: As e-mail has proven, the Internet greatly facilitates two-way communication. • Permits users to simultaneously share images with multiple facilities: The Internet certainly facilitates this aspect of information sharing. • Avoids repeat exams of images archived on the cloud: Fewer exams will need to be repeated and, over time, prior images will be available to physicians. As is often the case, a change that brings improvement in some areas creates its own new problems. P@@x included some of those in the list. • Requires manual administration of end-user access: When you give a patient a disk to take to another provider, your role in transporting the information is usually complete. When you post an image to the cloud archive, you assume a role in making sure the data securely make their way to the intended recipient and that the recipient can access them. • Requires manual verification of end-user credentials as the person who should have access to the images (or information): Managing end-user access also includes precautions to make sure only the appropriate people have access to the images. • Involves manual quality assurance—trust—that the images uploaded to the cloud actually belong to "my" patient: Uploading images from your PACS requires a quality assurance procedure so that Mrs. Jones’ images are indeed her images and not Mrs. Smith’s exam. • Can require paying twice to store images, once on your local PACS and again on the cloud: Someone has to pay for the cloud system. 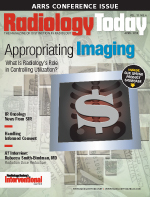 Will that prove to be the imaging provider, the end user, or the patients? The cloud computing companies are taking various approaches to this question. • Costs more than creating a CD and giving that CD to the patient: A more expensive solution needs to provide clearly better results to be a value proposition for healthcare organization. P@@x created a pretty good list of the potential advantages and challenges of cloud archiving. How this approach fits (or doesn’t) into the emerging world of EMRs and PHRs remains to be seen. The approach has elements of both. If part of a hospital-managed organization, the facility retains the responsibility for managing HIPAA privacy and security concerns. If the images in the cloud were released to the patient and become part of the patient-controlled PHR, the hospital’s responsibility for those HIPAA concerns ends.